How To Be Debit Card Safe #Infographic ~ Visualistan '+g+"
You often hear about data breaches that often sound like the damage is going to happen again. How do you make sure that you keep your debit card safe in the future when you use it? We have a few different ways that you can do so. Tip #1 – Check The Area You want to make sure that you use a debit card machine in a heavily populated area. Those areas that are dimly lit are prime locations for scammers, because they have a much better chance that no one is going to see them do their dirty work. Tip #2 – Observe Your ATM You want to make sure that you carefully observe the ATM, to ensure that you are not prone to skimming. You can easily enter your card into the wrong ATM and find out that someone is likely to take your money. Check to make sure that the actual ATM is entirely legit. Tip #3 – Use Alternatives Cash is relatively easy - the transaction ends when you give your money. However, a credit card has a number of different benefits. Your bank account is not at risk with a credit card. You also have a much longer period of time to report fraud if you use credit as opposed to using debit. Tip #4 – Be Careful Online If you look at the Target breach, you will find that using a card online is not without its risk. If you have a card and use it online, chances are that the information could be intercepted. The best option is always going to be to use a virtual credit card that only has limited funds on it. Even if someone does hack it, you will never have to worry about increased expenses. While your debit card offers tremendous convenience, it will not feel so convenient if someone manages to take the money out of your checking account. 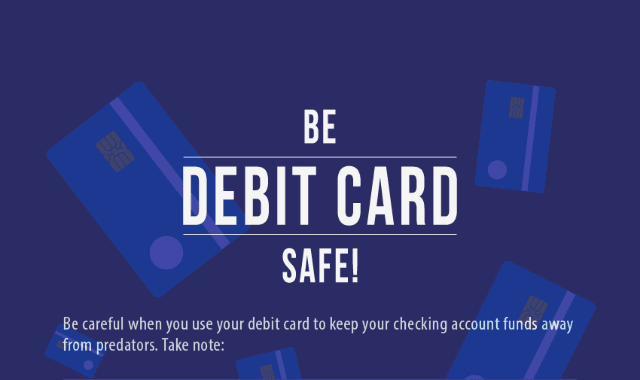 By using the tips and the additional ones in our infographic you will be able to prevent debit card damage.